This Friday, May 27th at 7pm, we’re looking forward to welcoming acclaimed writer Robin Black to read from her collection of short stories, If I Loved You, I Would Tell You This. Black’s writing has appeared in a variety of publications, including the New York Times Magazine, Southern Review, One Story, Georgia Review, and many others. She has been noticed four times for Special Mention by the Pushcart Prizes. 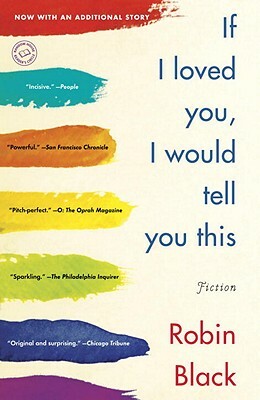 If I Loved You, I Would Tell You this, now out in paperback, was a finalist for the Frank O’Connor Short Story Award. BookPeople’s Liz Wyckoff spoke with Robin about her collection, her writing life, and which books are on her bedside table. We’re highly anticipating her event here on Friday. We hope you can join us. Q: Robin, we’re very excited to be hosting you at BookPeople in celebration of your debut book, If I Loved You, I Would Tell You This. You’ve said these eleven stories took eight years to write. What originally inspired you to pursue creative writing as a career, and what helped you stay committed during those eight years? A: For many years, throughout my twenties and thirties, even in my teens, I had wanted to write and had taken stabs at writing, but between having three children and also a life that seemed to overwhelm me in various other ways, I just never got the momentum going. The real push behind writing at all, I think, is a deep interest I have in–maybe even an obsession with–the way people interact. I just find it endlessly fascinating, all the ways we move toward one another and back away, how we cope with the many things life throws our way. Writing for me has always been a way to express all of those observations. I did have difficulties with finishing things sometimes and other mechanical aspects of writing, but once I took the leap at 39, I have never had trouble staying committed to writing. I have more trouble doing the other things I should be doing–like cooking dinner, cleaning the house. . .
Q: In your Random House interview with Karen Russell, you mentioned that you are a “remarkably inefficient” writer, who “throw[s] out a good 80 percent of what [you] write.” I was interested in (and impressed by!) this description of your process because, so often, writers feel bound to their words once they are down on the page. Do you have a personal writing motto—“Delete or perish!,” perhaps?—or have you received any process-related advice that you’ve found particularly helpful to your development as a writer? When I was in college in the early eighties, I studied writing with Allan Gurganus and he had us write a story a week. I’ve always credited that process with disabusing me of the idea that everything I would ever write would be worth saving. Allan’s class–and Allan’s great teaching–showed me that the words you write but don’t save are necessary to get you to the ones that you write and DO save. I try now to be ruthless about remembering that all that matters is the story. Not an individual sentence, not a lovely passage, not even the original idea for the story, but the story that needs to come out, the best story you can write. Q: You’ve incorporated repetition into the structure of several stories in this collection—for example, the repeated phrase, “If I loved you, I would …” in “If I Loved You,” and the narrator’s habit of scanning lines for their iambic quality (ba-duh, ba-duh, ba-duh), which is repeated several times, in “Gaining Ground.” Do these forms of repetition play a part in the initial construction and shaping of your stories, or do they emerge naturally as you write? Pretty much everything emerges as I write because I am not the sort of writer who plans much in advance at all. I have tried to turn this into a virtue by keeping my self open to as many turns and surprises as possible, but the truth is it’s just my nature. I have tried to work with outlines and plans and it’s always resulted in pretty stultifying, predictable work. So things like the odd repetitions you mention are always surprises to me as they appear. Q: I find so many aspects of your short fiction engaging—the multifaceted characters; the realistic and often hilarious dialogue; and the plots, which incorporate scenes of intense action without succumbing to melodrama. As a creative writing teacher and accomplished author, do you ever still feel like a student? Where do you turn for help when faced with new writing challenges? This sounds a little hokey but the truth is that when I stop feeling like a student, it’ll be time to stop writing. I am always learning from other writers, from my own students, and really from every impulse of my own to try and convey something. Each sentence, each passage is its own new challenge. If it isn’t, then you’re just doing the same thing over and over. You asked earlier what keeps me committed and I realize that’s part of it, the excitement of learning over and over how to communicate an observation or how to make a metaphor work without being either too heavy or too obscure. Q: In addition to the short stories in If I Loved You, I Would Tell You This, you also write nonfiction and are currently working on your first novel. In honor of National Short Story Month, and as someone familiar with different genres of creative writing, can you talk about what you find specifically pleasurable about short stories—imagining, writing, and/or reading them? A: In the end, I think what I love most about short stories is the sense of compression. When I paint, which I do quite a lot, I am a miniaturist and there, too, there is something magical to me about the representation of an entire world in tiny, tiny brushstrokes. There’s always that sense of a reality that’s in danger of bursting the bounds of its container. This is all pretty abstract I realize, but it has to do with understanding that each element of a story has to perform many tasks, must have many meanings, and with the energy that results from that. Q: On a similar note, short story collections rarely receive the same amount of attention as their longer, fictional counterparts. Can you recommend, for our BookPeople customers, a few short story authors or collections that have influenced and inspired you? I love A.S. Byatt’s LITTLE BLACK BOOK OF STORIES. I have also been taught a tremendous amount by certain Andre Dubus stories: “The Winter Father,” “Adultery.” I am a huge Mavis Gallant fan. THE PARIS STORIES is always on my bedside table. And I am always on the lookout for more!! Next Post Happy Birthday Bob!